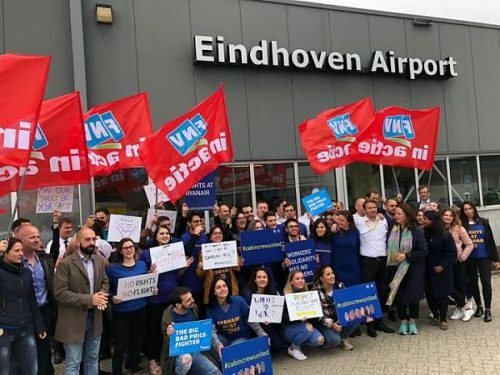 The Dutch labour authority (UWV) has ruled that Ryanair cannot fire the workers affected by the closure of its base at Eindhoven Airport, marking a significant setback for the airline’s industrial relations model. In October Ryanair announced it planned to close its bases at Eindhoven and Bremen and downsize operations at Weeze, citing the impact of strike action over the summer. ITF, ETF and the unions involved – FNV in the Netherlands and ver.di in Germany – immediately condemned this move as an attack on workers’ fundamental rights. In justifying itself to the Dutch authorities, Ryanair cited “economic” reasons for the decision. While the bases have remained closed since November, unions have been active in supporting the workers affected through legal action. This week’s decision by the UWV means that Ryanair cannot dismiss 16 pilots and 15 cabin crew on these grounds. Unless the airline reopens its base at Eindhoven, it will have to continue paying the workers as if they were operating aircraft as normal.